Birch water/sap can be drunk as a tonic and it is a traditional beverage in Poland (you can buy birch water in shops in Poland, but unfortunately it’s sweetened with sugar – so avoid that), Belarus, Ukraine, Russia, Lithuania, Latvia, Estonia, Finland and elsewhere in Northern Europe as well as parts of northern China. It is a living birch water which has restorative and detoxifying properties. The traditional virtues of birch and its efficient removal of toxic substances from the liver and kidneys have been known and appreciated for ages. There are very few phytotherapeutic ingredients that are capable of targeting the body’s two major cleansing and purification systems at the same time. • The kidneys (diuresis): by eliminating and filtering waste through the urinary tract. Birch water also contains compounds called saponins, which research suggests to have powerful cholesterol-reducing properties. Birch water contains only 18 calories per 100ml, less than coconut water. • Toxins that only the liver can process. These include: alcohol, saturated fat, triglycerides, food colouring, additives, pesticides, remnants of industrially-processed foods, over-cooked fat, and preservatives. • Waste that only the kidneys can eliminate. These include: excess salt, uric acid, phosphates, certain medicines, urea, and ammonia. Thanks to these two cleansing properties, birch sap deeply detoxifies the body, making weight loss easier. If you’ve gone overboard over the holidays, then this is the deep detox you require! Birch sap contains natural carbohydrates, organic acids, fruit acids, potassium, calcium, phosphorus, magnesium, manganese, zinc, sodium, iron and copper, vitamins B (group), vitamin C. Every year, I consume 8-10 litres of fresh birch sap (and have been for most of my adult life). Birch water destroys uric stones, is effective at treatment of stomach and liver ulcer, headaches, bronchitis, cough, and also at rheumatism, radiculitis and arthritis, removes harmful substances from the body. Regular consumption of birch water has fortifying and tonic action. 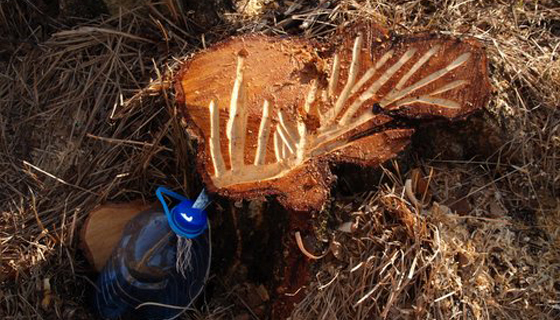 Above all, birch sap possesses recycling capabilities and stimulates metabolism, it is a fine dietary and refreshing drink. Having said all that, I found almost no clinical evidence on the health effects of birch sap (mainly because there haven’t been much research done to date on this subject) as opposed to massive research on the health benefits of chaga which grows on birch trees! For instance, one single study suggests that despite the detectable anti-inflammatory, antipyretic and phagocytosis-inhibiting effect of birch sap no therapeutic activity of importance compared with classical and modern antipyretics/analgesics has been demonstrated (Klinger et al., 1989 *). 1) Find a birch tree (harvesting the birch sap is time specific i.e. the first warm weeks of spring thaw – when the temperature is about 10C in March-April time – when the birch trees wake up from the winter sleep and then the birch trees can be juice for about couple of weeks). The juice flows best during day – midday – especially when it’s warm and on the warm, sunny side of the tree. 2) Cut the end of one of the branches (another way is to drill a hole in the tree and attach a plastic tube or make a cut in V or Y shapes on the birch tree and attach a bottle underneath). 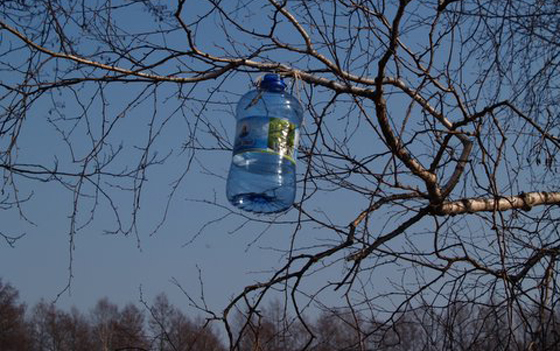 3) Attach a plastic bottle to that branch. 4) Wait until it fills in with birch juice (depending on the birch tree it might take a few hours or overnight to fill in the bottle). 5) Drink the birch water or you can freeze it as ice cubes (and use it later with vodka – you can actually buy vodka made from birch tree sap, it’s called ‘brzozowka’ in Ukraine – see how to make birch sap wine below). The birch juice is probably the best (birch sap has sugar content of about 2%) at the beginning of the juicing season and you can easily juice about 2 to 7 litres of the birch sap a day. The cut or hole in the birch tree will heal naturally so there is no harm to the tree in juicing them or any other trees (you can juice other trees such as maple, walnut, apple, cherry and other 22 trees that can be tapped for sap and syrup). You can also make birch juice/sap wine. I haven’t tried this recipe but I’d be interested if instead of sugar one could use xylitol which is a kind of sugar made from birch trees. You can also get birch juice tincture – birch juice as an organic health supplement to help you detoxify your body I once got lucky and found a freshly cut down trunk of the birch tree. So I made some groves in the trunk to get my birch sap. Although the tree was cut down the birch water was flowing abundantly. You can also drink birch tree leaf tea. You can buy the birch leaf tea tea online or if you see a birch tree just take some fresh birch leaves and brew them for a few minutes. According to Professor Barbara Maher‘s research (at the University of Lancaster), the birch trees were able to absorb more than 50 per cent of the particulate dust — linked to respiratory problems — from passing traffic, much more than other species. London should plant more birch trees. According to some environmental groups air pollution in London is one of the worst in the world. *Klinger, W., Hirschelmann, R. and Suss, J. 1989. Birch sap and birch leaves extract – screening for antimicrobial, phagocytosis influencing, antiphlogistic and antipyretic activity. Die Pharmazie 44(8):558-560. Posted in Birch tree, Health and tagged Birch sap vodka, Birch sap water, Birch sap wine, Birch tree juice or birch sap.